We all think about things differently, and we all see things differently. We all change the way we think and see things throughout our lives. When we are kids, the world is a place where anything is possible, and when we grow up we want to be our favorite cartoon character. But as we get older, we start to see the world through a more sophisticated lens, a lens that can sometimes skew the real vision we once had for ourselves. Throughout this past week, I found myself returning to my childhood, and for those few moments, it felt amazing. There were honestly moments this week where I questioned whether I was five years old or twenty-one. For my Ecuadorian Culture class, which I have named therapy class (because we talked about why things are the way they are here), we had to visit various markets throughout the Quito area. As an additional part of this assignment, we had to make an Ecuadorian dish with our host families to share with the class. So basically show-and-tell. My host mom took me to a huge fruit market in Quito, and together we purchased 13 plátanos verdes (green bananas, not to be confused with unripe bananas) for two dollars. With these plátanos verdes we would be making patacones, which are a popular side dish. I felt like a child as I incessantly pointed to strange fruits I have never seen before and asked, “What is this? What is that?” But hey, how else are you supposed to learn? I have found this to be a cultural thing, but my host mom limited my role in the patacones making process. I stood by like a wallflower as she peeled, sliced and fried the bananas. But here is where my role came in. I got to smash the fried bananas down, so that she could re-fry them. As I stood there smashing the bananas down with a jelly jar, it brought back memories of “helping” my grandmother and mom cook when I was little. Show-and-tell turned out to be a huge success. Who would not enjoy a class period of trying homemade Ecuadorian dishes? I sampled several juices such as tomate de árbol, babaco, and the seasonal colada morada. Another student brought in pan de yuca, which is a recent favorite of mine. 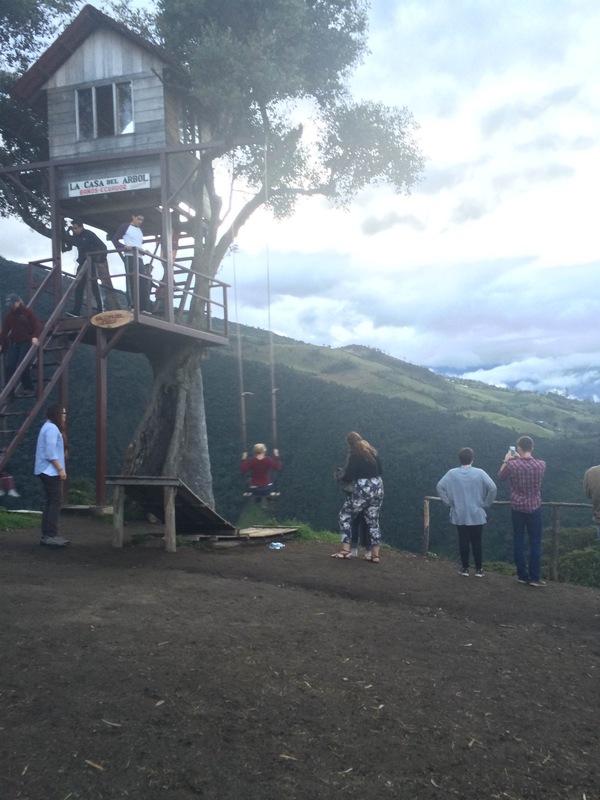 This past weekend, I had the opportunity of traveling to the touristy town of Baños. For those of you with Spanish knowledge you are probably thinking, “Is that town really named bathrooms?” But actually, the town is named for several hydrothermal pools that are in the area. The town is known for adventure sports, and I did my best to take advantage of that. My day started off by zip lining through the mountains. 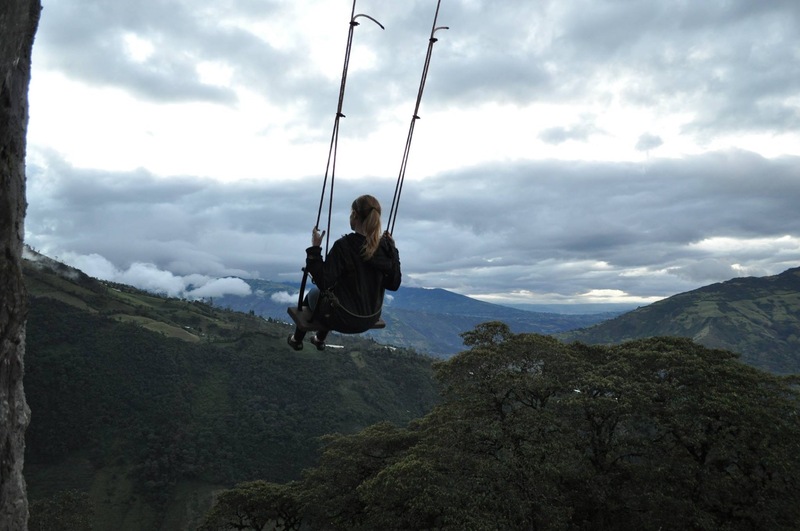 For some reason, hanging from a cable and staring out at the Ecuadorian landscape never gets old. 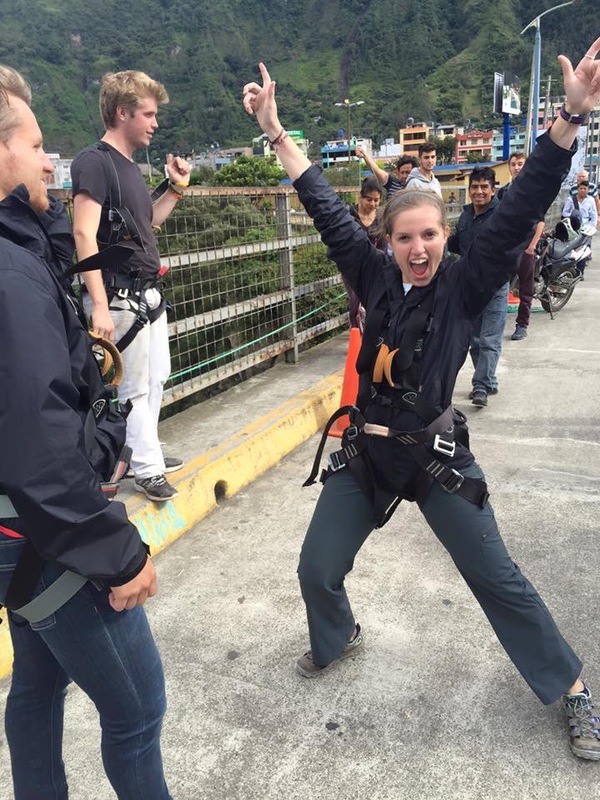 An activity unique to Baños is something called “puenting” which basically means bridge jumping. I thought to myself, “when am I ever going to have another opportunity to jump off a bridge again in my life?” So I signed up. 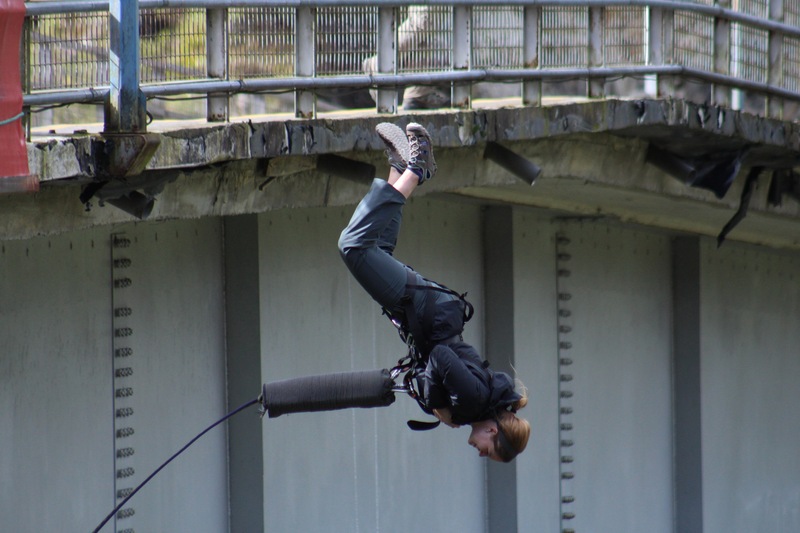 Surprisingly I was not nervous at all until I stood on the small platform on the edge of the bridge, and looked down. As I stood 400 ft. above the ground below, every single survival instinct in my head would not let me jump. All I knew was that I just needed to turn my brain off for one second and I would be fine, so that’s what I did. If you have never had a free falling experience, I highly recommend it. Puenting was a huge highlight of my trip so far, and I would definitely do it again if I didn’t already promise my mom I wouldn’t. At sunset, I found myself on a swing that seemed to go straight off the side of a mountain. The Swing to the End of World is highly sought out by tourists and even though I am not huge into tourist attractions, I was in awe. There was just something about carelessly swinging into the sunset that really humbled me. We do not need to put our dreams on the back burner because they seem too impossible, or make a decision just because it is “safe.” This week of reminiscing about my childhood reminded me that sometimes in order to see the world differently, we need to become a child again.